Well, hello Wednesday! Usually I’m really happy when the middle of the week rolls around, because that means the weekend is almost here. But today…well, today feels like a Friday, which means that when I wake up tomorrow to come to work, it will be especially disappointing. I hate when that happens! But, then I look at these tostadas, topped with delicious guacamole, and it makes the rest of the week a little easier to face. Wouldn’t you agree?? I’ll admit that when I first thought about putting spinach on this tostada it weirded me out a little bit. I like spinach, so that wasn’t the issue, I just wasn’t sure how it was going to work on a tostada. Bev is a genius though, and it really did work! The seasoning in the black beans was fantastic, and I’ll never turn down guac…never ever ever. Oh, and the fact that the tostada is a flour tortilla…even better!! I love me some flour tortillas. All-in-all a deelicious dinner (and meatless for those of you who participate in lent)! Lightly brush the tortillas with oil and place them on the prepared baking sheet. Bake for about 4 minutes per side, or until lightly browned and crispy. Meanwhile, place the beans in a small saucepan, over medium-low heat. Add the taco seasoning, a few of the cilantro leaves and a good pinch of salt. Stir to combine and turn the heat to low, until ready to serve. Heat a large skillet over medium heat, add the spinach, and toss to wilt, about 2 minutes. In a small bowl, add avocados, remaining cilantro, about 2 tablespoons of the lime juice, a dash of seasoning, and a pinch of salt. Mash with a fork until smooth. 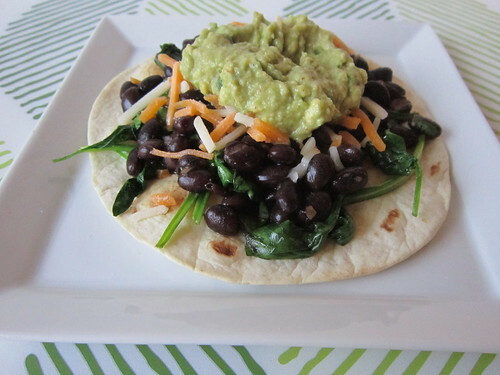 To assemble the tostadas, layer a little of the spinach on each tortilla and top with a spoonful of beans, a sprinkle of shredded cheese and a dollop of guacamole. Serve immediately! Looks very good – healthy too!